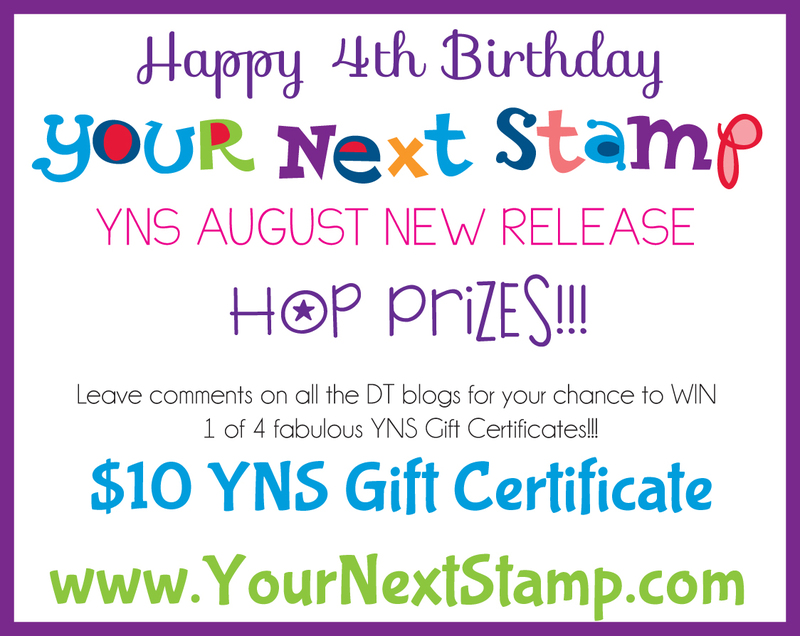 Well, hello and welcome to the YOUR NEXT STAMP August New Release Blog Hop!!! August is our birthday month and we are having a month long celebration with store specials and a second release-wooOHOooOOO! If you’d like to hop along with us, the hop starts on MAUREEN'S blog HERE. 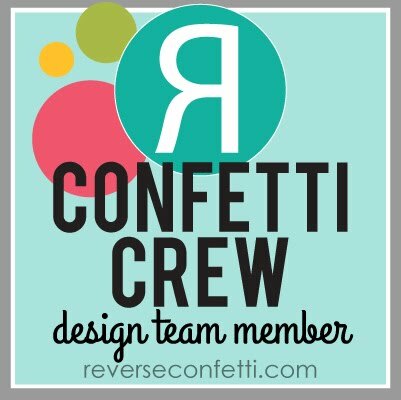 If you’ve been hopping then you should have arrived from our fabulous GUEST DESIGNER, WENDY R.'S blog HERE. Want to win some PRIZES? 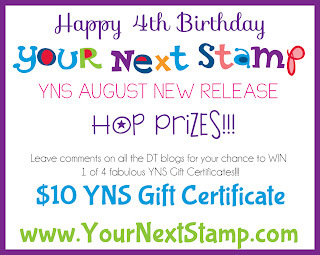 FOUR random winners will receive a $10 YNS gift certificate, but you must comment on all of the DT blogs for your chance to win! I absolutely LOVE LOVE LOVE the new stamp set called OVERDUE. I had asked Karen about making something like this and LOOK! She DID, and it's PERFECT! It includes a great mix of dates and sentiments that work for any number of occasions and also would work very well as an addition to a Project Life collection. The best part? It coordinates perfectly with the new CLIP IT Die collection that cuts the library card out for you and comes with a few other office-y things such as the tape strip, heart and tack--super cute, huh. For my other card, I couldn't resist working with this sweet bunny, BREEZY, being taken away by only an umbrella. That never happens to me. See that cute swirly? 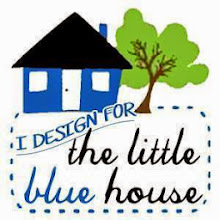 It's from the new POCKET DIE set. It's just an accent piece that comes with it and I just didn't punch out the inside of the swirl for a different look. If you haven't seen this die set yet, you NEED to check it out at the YNS Store. It's a MUST have and I can't wait to show ya'll another project in a couple of days that I'm making with it! Ca--ute!! 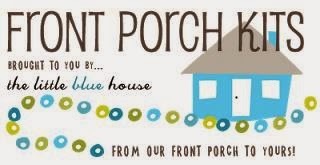 So here's a sweet deal--Karen is also offering some fabulous Hop Specials at the YNS Store! 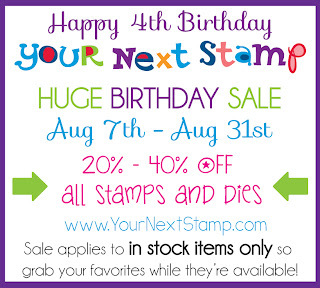 Any orders over $25.00 will receive a FREE YNS Birthday Stamp!!! 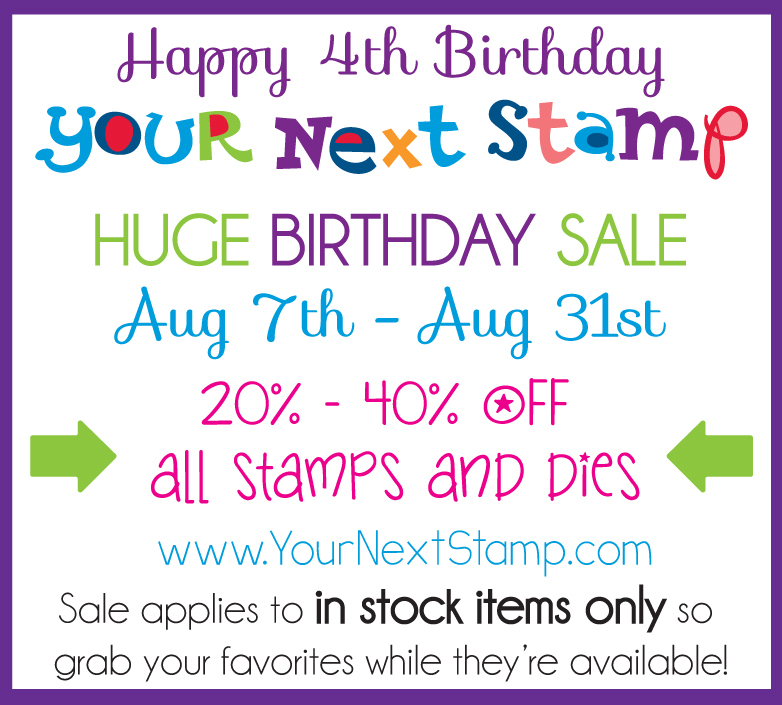 Plus, YNS is having a month long sale so make sure you take advantage of these special offers! 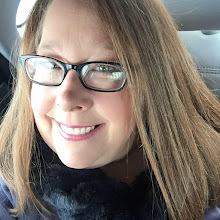 Now it’s time to hop on over to WENDY M.'S amazing blog HERE (how'd I get sandwiched between 2 Wendys? ), but don’t forget to leave a comment before you go! Thank you so much for stopping by and as always, happy hopping and shopping! SUSIE Q-TIP: Not only can you use a metallic colored ink pen to make something look like shiny metal, but you can also use a silver Prismacolor pencil. Especially when your elusive metallic pen is hiding. Don't ask me how I know this, but I'm sure glad it worked. oh my...both cards are so wonderful..the layers and the coloring!!! Great cards. I like the bright colours that you used. These new die sets are super cute. Hermosas tarjetas!!! Mi preferida es la del conejito... graciosa y muy tierna! Great cards and love the colors! Love the bunny, great color combos! These are adorable! Love that overdue set! Susan your cards are outstanding. Your fussy cutting is amazing! These are so cute!!! Love the bright & cheerful birthday card, and that bunny looks so cute with the subtle background! Way cute... I love your color choice and all your details. Very cute and colorful cards. These are just adorable. LOVE the new stamps and dies. Such wonderful colors. Fabulous, love the paper patterned card on the first and your bunny is coloured beautifully along with the shading on the umbrella, Love them! The bunny is darling. I love love love your overdue card!!! Sweet cards...love all the patterned paper ( especially the on the library card ) on the 1st and the cute bunny image on the 2nd. Great new products coming out. Loving the library card and sentiments. Great color choices, always love your colors. Great cute little rabbit image and design. Fun cards.